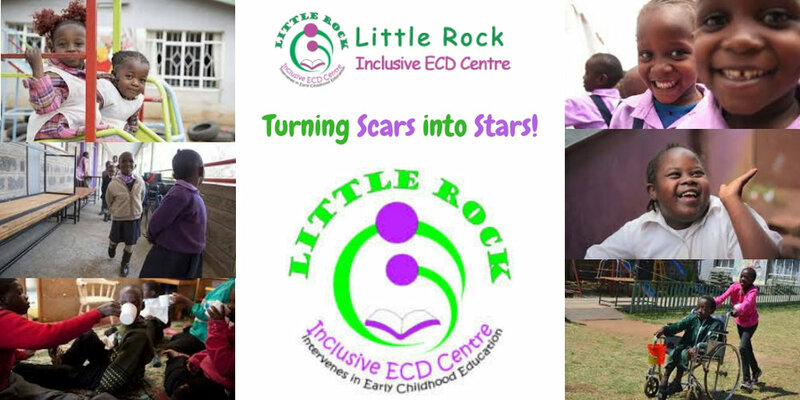 Little Rock ECD: Turning Scars into Stars! In my memoir Two Years of Wonder, there a number of children who experience increased vulnerability due to developmental, cognitive, or physical disabilities. For a long-time there were no places for these children to receive therapeutic services, much less an education in Kenya. There are still too few. But one of the organizations working to change that is Little Rock Inclusive Early Childhood Development Center. I first visited Little Rock Early Childhood Development Center in Kibera in 2006, when I was a graduate intern for CARE USA. Little Rock ECD Center was founded in 2003. It was the ONLY ECD center where the CARE Kenya staff could refer children with special needs in 2006—and these needs ran the gamut from hearing impairment to cerebral palsy. What struck me most about that first visit was the powerful feeling of love and warmth I sensed from the staff and the children. By 2006 I was already a bit of a veteran when it came to visiting children’s homes, pre-schools, and primary schools. I could tell that at Little Rock ECD Center, something was different. There was a unity, solidarity, and genuine determination to give the children there the best chance possible—despite the lack of resources. This came across powerfully when we stopped by for a visit and class was not interrupted so that the children could perform song and dance for us. An aside: another song and dance by children is the last thing you want when you do a school visit—what you want to see is how the school goes about the business of teaching children! The interactions among the children were also remarkable to me. Little Rock ECD was (and still is) an inclusive school environment, where children who are “normal learners” are integrated with children who are not. I remember seeing children without special needs helping their friends who did eat, play, and learn. It was remarkable to see: these young children who did not flinch from one another’s differences, who didn’t think twice about helping one another. There was no shunning here, no shame, no stigma, only love, fellowship, and solidarity. I visited Little Rock every time I’ve been to Kenya since. I’ve seen them move to a larger campus as they have grown. The same spirit of inclusion continues. As I watched the children play soccer on my last visit in 2015, I realized ALL of them—hearing and hearing impaired—had been taught sign language in order to communicate. There was no telling who was hearing impaired and who was not. Throughout the game they all signed to one another. In additional to successes like these, over the years, the school’s services have broadened further, with trained staff and facilities that can accommodate and treat children with a wide range of cognitive and physical disabilities. All this started when Little Rock’s founder, Lilly Oyare founded an ECD center in 2003. It was her goal to focus on vulnerable children in her community. When one child named Melody (more on her below) came to the school in 2006, Lilly faced a dilemma. Melody had cerebral palsy. Due to that, she was more vulnerable than most. Lilly realized they had no training on how to deal with such a child with Melody’s needs. But if Little Rock was to be true to its goal of meeting the needs of the most vulnerable children, Lilly knew they had to accept Melody—she had nowhere else to go. Even though the staff were not sure how they would continue, they opened their doors to all children with special needs after that. The rest, as they say, is history. Little Rock now has had thousands of children pass through its classroom, hundreds of them have been children with special needs who had received the finest levels of support available. They have classes and after school programs not only for children, but trainings for parents on everything from child care and nutrition, to business generation and microfinance. I wanted to provide a glimpse of who Lilly Oyare is, so I sent her a few short questions over email. Her answers are below. T: Hi Lilly, can you share what inspired you to start your foundation? L: What inspired me were the lovely faces of the many children I met in Kibera informal settlement. They didn’t look any different than the ones I had in my house, thus they had they had the same motivations to build their dreams of being pilots, doctors, nurses, teachers, and pastors. T: What are you working on right now that has you especially excited? L: We are working on a Manual of Inclusive Education and we are fundraising to build a resource center for children with special needs who are unable to transition to primary school because of their disabilities. T: Is there a particular success story you’d like to share with readers? L: Out of the class of 3 year-olds who were admitted among the Baby class in 2004: 13 are joining university and technical college this semester—2018—to pursue a number of different courses. Melody, [Little Rock’s first student with special needs] who has cerebral palsy, completed primary school and has been admitted to high school. She wants to be a lawyer to advocate for the rights of children with special needs. T: What can readers to do be more involved and to support your cause? L: Readers can participate in our fundraising activities through our global giving platform (providing early childhood education to 250 children). You can send money through our Paypal account or one can donate through direct debit. T: Bonus question, what do you do when you’re NOT working, for fun, to restore your spirit, and/or relax? It’s thanks to people like Lilly that children with dyslexia, such as Miriam in Two Years of Wonder, can get help so they can have a chance to learn, succeed, and thrive. If you’d like to donate to Little Rock, here is the link to their site: http://littlerockkenya.org/newsite/ The donation link will take you right to their Paypal account.